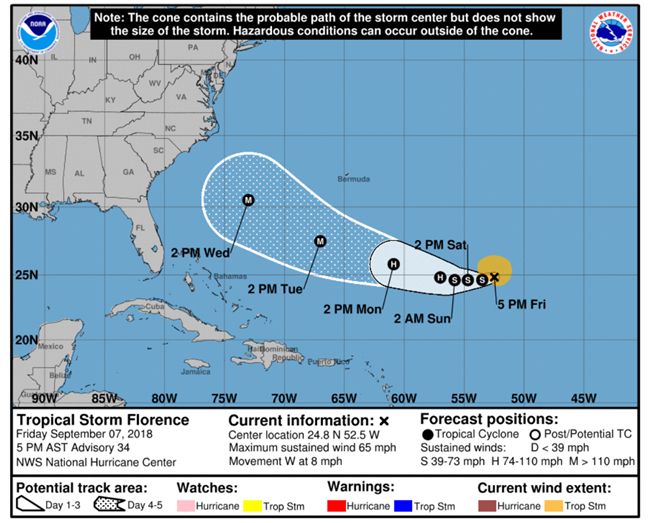 I'm watching it intently, as I am supposed to run a 55' yacht over to Nassau, Bahamas on Thursday and spend 2 weeks over there. It's way too far out to really tell where it's headed at this point, but most of the models show NC. I spent over a decade working emergency service work in three counties in the Cape Fear area. They have some excellent agencies and personnel. Multitudes better than when the last big one hit. But there are exponentially more people living down there. And a lot of them are retirees that have never seen a real hurricane. I am glad that it’s not my responsibility, but I’d be more than happy to go help if I was tasked with it. They are certainly due a big one. We have a house on Oak Island that has survived 35 years so far since it was built. I hope it can withstand what comes. Every year they say it’s going to be the worse year ever, but it’s been very mild for a long time. Not concerned yet but paying close attention to it. If I lived from Jacksonville to the outer banks, I’d be making preparations now. This will be at minimum a Cat 3, 2 days before it makes landfall. That gives it plenty of time to get even stronger by the time it reaches the CONUS. Read the 5:00 a.m. update and discussion. Could be a Cat.4 on Thursday. I have folks that are still drying out from Matthew in NC, thinking of heading towards Wilmington/Jacksonville when retirement years catch me. If I lived from Jacksonville to the outer banks, I’d be making preparations now. Anyone who lives in this area and is not already prepared is doing it wrong. I'm on the state emergency response team that goes and works communications in disaster areas. We got a heads up two days ago to be ready to roll. I'm packed and waiting for deployment orders. I just hope it's not as bad inland as Matthew was in 2016. Ugh, not liking that last update. So much for the "experts" saying this will be a quiet hurricane season due to sand from the Middle East. The storms seem to be lining up since then. Nah. The God Damned Commies have been praying for this to hit DC, tear up things so the vote on Kavanaugh can’t take place as scheduled. Maybe a couple of Senators will be washed out to sea, or the dome of the Capitol will fill with salt water, anything to put it off. Please delete your post so the thread doesn't get locked. Not to worry, the judge is in. Conjuring up Florence ain't gonna stop destiny. I'm watching and watching this one for reasons stated above (and follow lots of hurricanes over the years). But I'm having a hard time believing that it's going to pick up so much wind speed so quickly and start moving so much faster......guess we can only wait and see. The ocean temperatures have been a little above average in most locations along the Atlantic coast. Fuel to the fire, so to speak. As I was walking out of the grocery to top off some supplies I got the emergency alert on my phone that we’re all going to die. Ok, maybe it didn’t say that exactly, but I’m sure everyone will be in full panic mode in the next 48 hours here in Charleston. Other than a fresh loaf of bread and a few bags of ice, I'm ready for it in case it comes up the Chesapeake Bay and bombs out. Folks from Jacksonville, FL northward need to monitor the situation. Now that I'm back in Florida, I've stocked up on Tony's Clam Chowder from Publix. I'm all set.